Well I only have enough energy for a quick post today. Yesterday, I spent the cold, blustery day, inside quilting and was able to finish off my baby pinwheels. Yippee! Unfortunately, despite all my efforts at improving my rotary cutting skills, they were all under the size they were meant to be, which meant that everything was off for the rest of the quilt, AGAIN! So that meant I had to yet again square up. I decided rather than messing with ¼ of an inch, just to go even, so now they are 4 inches square. My tiny quilt is getting even tinier! Oh well, that means it will be easier to machine quilt, right?! Anyway, so today I squared up all by background squares and now I just have the big pinwheels to do. My in-laws’ dog, Zagan kept me company all day as we are dog sitting this weekend. 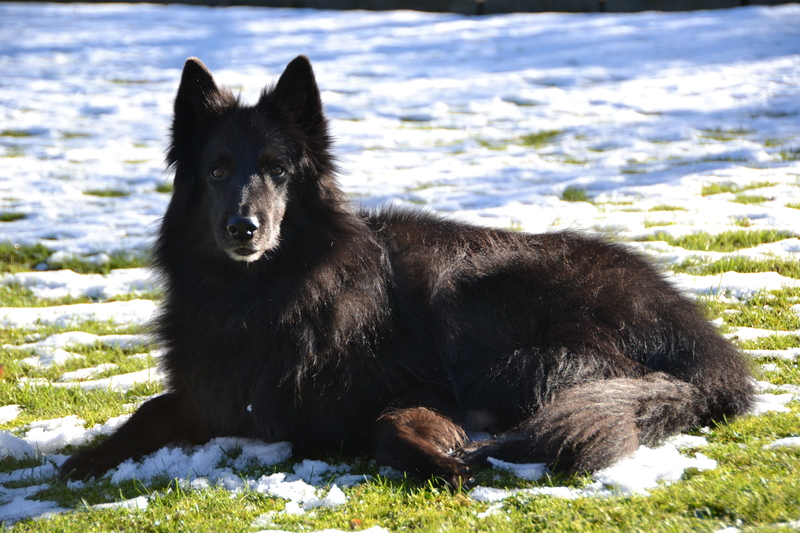 Zagan, a lovely, well behaved and loyal Belgian Shepherd. It’s so funny how much dogs are like children. You should have seen him when they went to leave, just like a kid, whimpering “You’re not going to leave me here now are you!” And all the luggage they sent with him: cheese (cut up into nice even little pieces and stored in a Tupperware container) to go in his doggie food, along with a package of bologna and let’s not leave out, his little doggie “lunch box” complete with water container. Gaby and Jürg were going to the Basel Christmas Market, which is huge in comparison to the one I went to last week. I’m so jealous I would have loved to go. I’m sure I would have been able to get the blue and white, polish pottery I collect there. (But I keep telling myself, Christmas is the time for giving; giving other people stuff, not yourself. Anyway, I’m really excited because Yves came home today, after his Christmas shopping and errands with Series 1 of Heartland. We desperately needed something to watch now that all our series seem to be on holiday right now (Downton Abbey, Revenge, Nashville and the Mentalist). We’ve just been watching Criminal Minds, and to tell you honestly there are only so many unhappy endings a dreamer like me can take. So although I know Heartland might be a bit corny at least I can depend that it will soothe my country girl heart, rather than terrify it! 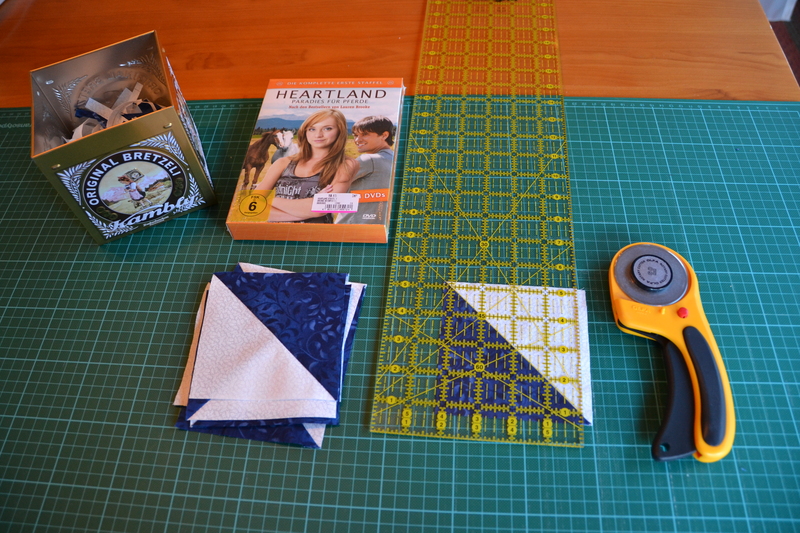 Heartland, and my (supposedly dutch fabric), half-square triangles. So hope everyone has a great weekend with lots of quilting or Christmas crafting! Hi! Sagan looks so beautiful! They are often like children! I dog sit one sweet golden Retriever and we have always so good time together! One day I visited her and her ‘mom’ and then I wanted to take her the dog) for a walk – but she didn’t come! She thought it was too strange as her mom was at home. Perhaps she thought that mom leaves while she’s out with me. Finally her mom came with us for a walk! Yeah he’s like a wolf almost.It is hard to see them so “depressed” when their “parents” aren’t around. And how he loves to use this mood to obtain new snacks. Well it was a great weekend with him. Thanks for the tip with the pinwheels too. I think I will let it get smaller. It will just mean that it’s intended purpose has changed! Oh well! Can’t wait to see what is on the advent’s calendar today. I don’t know how you do it!